Better battery tech will cause prices to plummet. Between now and 2021, battery production all over the world will more than double, Bloomberg reports. With more companies getting into the game, expansion and competition are up, and prices are down. This will mean more opportunities for energy companies and electric car manufacturers, and better deals for consumers looking to purchase clean powered technology for less money. Gigafactory One in Nevada is Tesla’s battery producer at the moment. Daimler, the parent company of Chrysler, Maybach, and Mercedes, will be buying batteries from Accumotive’s brand new plant in Kamenz, Germany, which just broke ground this week. The installation of large-scale battery factories, which will supply Renault, Volkswagen, and others, are also planned in Hungary, Poland, and Sweden. Asia’s battery manufacturing industry will also be booming. BYD, LG, Samsung, and Tesla’s partner, Panasonic, are all major global battery producers. Right now, at least nine major new factories are being built in China. Batteries make up about 40% of the cost of electric cars, and so with this increased competition and the resulting drop in the price of these batteries is going to cause the cost of electric cars to fall. Benchmark Minerals reports that costs per-kilowatt-hour have dropped from $542 in 2012 to $139 where they are now. Benchmark analysts indicate that kWh costs will plummet beneath the $100 mark by 2020. 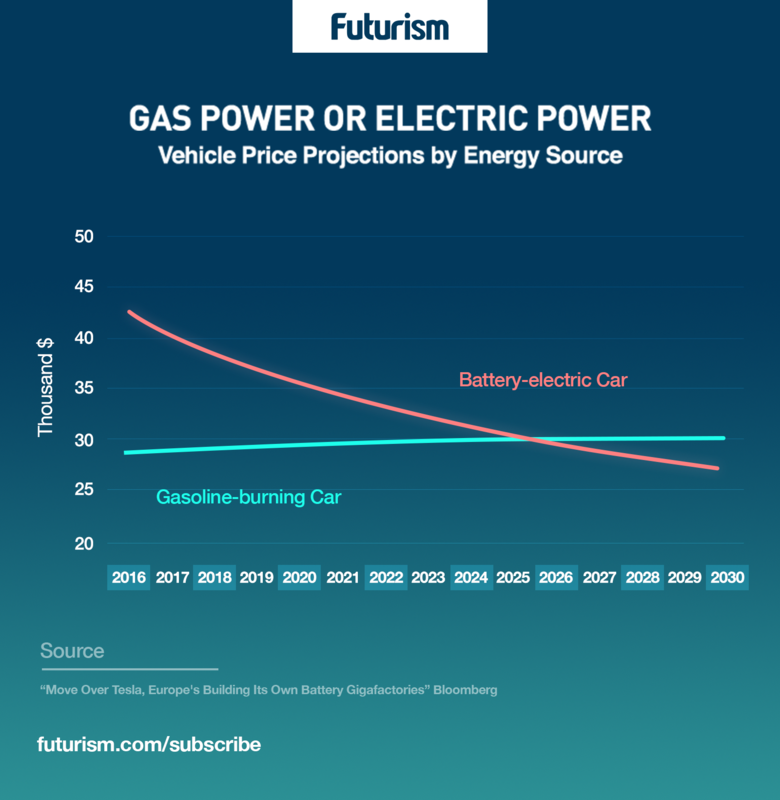 All things considered, Bloomberg speculates that the 2020s will see the real rise of electric cars — including their eventual overtaking of gasoline-powered cars in both cost and value. “As battery costs fall and their energy density increases, we could see cheaper battery-electric cars than their fuel-burning equivalents by 2030,” Bloomberg analyst Nikolas Soulopoulos commented in their report. Will costs drop too low for electric car companies to make a profit? It’s unlikely. India is aiming to ensure that all cars sold in the country are electric by 2030, and China is already replacing its enormous taxi system with electric cars. Tesla is also preparing to produce Model 3s on a massive scale for a broader market. And with all of this progress for electric cars, humans gain cleaner air, better public health, and more traction in the fight against climate change. So, while the fight against climate change will continue to be an uphill battle, the more countries, companies, and individuals that adopt technology that uses greener energy, the farther along we will be.